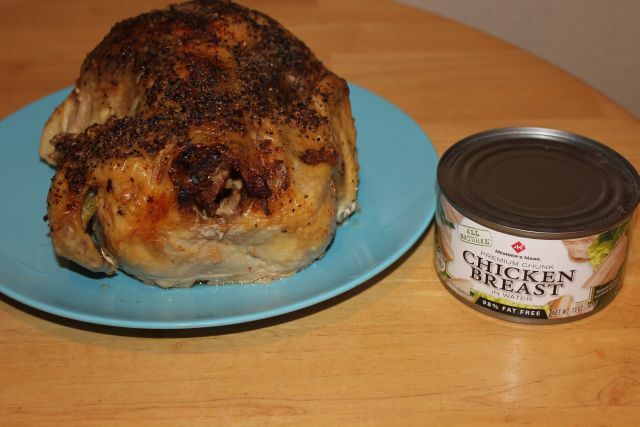 Over the last year I have been buying a lot of canned chicken from Sam’s Club. I buy the Members Mark brand which comes in a 5 pack. Each can is 13oz for a total price of $9.98 (We don’t pay sales tax on food in Texas). A few days ago our grocery store HEB had whole fryer chickens on sale for .67cent per pound. I decided to buy one and do an experience to see if it’s cheaper to buy a whole chicken, cook it myself, remove it from the bones, and separate it into 2 cup servings, then freeze or was it cheaper to stick to the cans and not worry about all the work? Don't get me wrong I knew it was pretty obvious what the outcome would be, but I wanted to know the numbers. We had friends over for dinner and a whole chicken was left over so I thought what the heck! Let's see what we can find out!! The chicken I purchased was 5lbs. for a total of $3.35. which is .67 per pound. 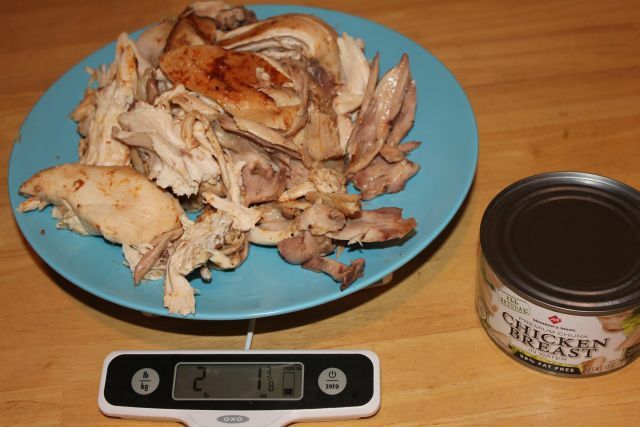 After I cooked the chicken it weighed exactly 4lbs bringing the total cost up to about .84 cents per pound. 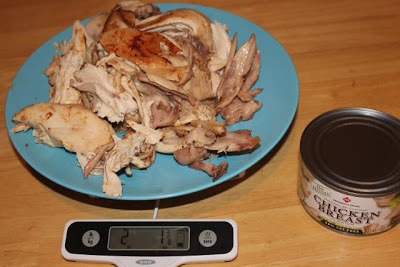 After I removed all the skin and bones the chicken meat weighed 2.1 pounds bringing the total up to $1.59/lb. OUCH in that case you are almost better off buying boneless chicken breast and forgetting about the hassle of de-boning the chicken. I can normally get boneless chicken breast between $1.50-$1.99/lb. The difference between buying canned verses homemade is a .05 cents savings per ounce when you go homemade. OK so .05 cents doesn’t seem like much but when you consider 1 pound is 16 ounces 16x.05 cents = a savings of .80 per pound. Almost $1 a pound … I will take a little extra work on a Sunday afternoon to save some money. I over paid on my 5 cans of chicken buy $3.25 OUCH! I can also see buying the boneless chicken breast when they are on sale and saving myself a ton of time and work! If you make your own chicken broth you have the leftovers to bring down the cost of your chicken. You can’t beat a freebie mixed into that equation!